At times, Finding Your Feet tries too hard to be crowd-pleasing. The romantic comedy from director Richard Longcraine offers all the highs and lows demanded by the genre. The “twist”, to the extent it can be named as such, is that the characters are in their 60s and 70s. Despite this, the story unfolds much as it would for lovers in their 20s or 30s, with the same giddy moments and “romantic complications.” Although not entirely unappealing, the narrative is overfamiliar with nary an original plot point to be found. 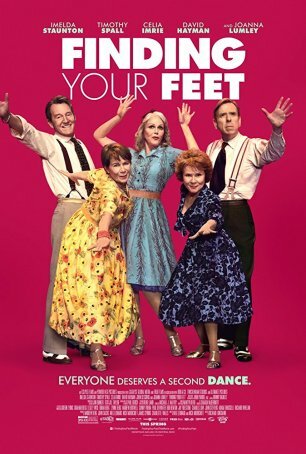 Admittedly, the typical romantic comedy thrives on tropes and clichés but the pandering in Finding Your Feet is so extreme that it gets old fast. One of the few differences between working with retirement-age characters as opposed to those who are a generation younger is that bachelorhood (or bachelorette-hood) is more the result of unfortunate circumstances than choice. Finding Mr. Right (or Ms. Right) isn’t an opportunity for a lifetime of bliss but a way to cheer up the twilight years. “Happily Ever After” for these individuals might be more in the line of a few years or a couple of decades at most. Sandra (Imelda Staunton) is single because she catches her philandering husband of 30-plus years, Mike (John Sessions), in a compromising position with her best friend, Pamela (Josie Lawrence). As a result of the subsequent separation, she moves in with her sister, Bif (Celia Imrie). Celia’s friends are all unattached for various reasons. Charlie (Timothy Spall) has the saddest story: his wife, suffering from late stage Alzheimer’s, is in a care facility and no longer recognizes him. Ted (David Hayman) is a widower who sometimes wonders whether life is worth continuing. And the pragmatic and vivacious Jackie is a five-time divorcee who may or may not be on the lookout for husband #6. Finding Your Feet has its share of amusing moments and some of the dialogue is filled with sly asides and quips. There’s also a great, laugh-out-loud sight gag featuring a man who gets an eyeful. Overall, however, the screenplay, credited to Meg Leonard and Nick Moorcroft, feels lazily assembled from the detritus of other romantic comedies with a little The Best Exotic Marigold Hotel and The Full Monty thrown in for good measure. Putting aside the ages of the performers, there’s nothing to differentiate this movie from many other crowd-pleasing romantic comedies. It feels more warmed-over than fresh and interesting. I was disappointed because Loncraine did a great job with similarly comfortable elements in his sports-themed romantic comedy Wimbledon. The cast is populated by accomplished actors, all of whom are in fine form. Imelda Staunton plays a role she could essay in her sleep as the uptight Lady who gets in touch with the free-spirit she once was. Celia Imrie is her impish older sister – a woman who has never settled down and enjoys early morning swims in freezing cold water. Timothy Spall, one of today’s finest character actors, uses his hangdog face to good effect as Charlie, Sandra’s second chance at love. Joanna Lumley steals a scene or two (as is her wont) as the salty Jackie. She has the film’s best one-liner. Perhaps aware that simply telling the story of Sandra and Charlie’s late-life courtship might not satisfy the running time demands of a feature, the filmmakers incorporate a dance competition and elements related to the mortality of a character. As a result, we get to experience a geriatric chorus line (I say this with great affection – the dance numbers are among the film’s most energetic sequences). The movie also tries very hard (too hard, actually) to get us to tear up. Loncraine’s manipulation feels more than a little heavy-handed. I can see where Finding Your Feet might work for those who are interested primarily in a story that feels like it was assembled using a checklist or template for feel-good movies. The cast is top-notch and the characters are sufficiently likable but the movie’s vanilla narrative repeatedly offers unsurprising plot points to the degree that the whole endeavor seems like an exercise in been-there/done-that. Finding Your Feet isn’t so much a bad movie as it is an unnecessary and ultimately forgettable one.